Queen Bee Half Marathon | Bee-lieve it, girlfriend. There’s a women’s half marathon in Cincinnati. The Queen Bee Half Marathon is on a mission: to promote the fun of fitness while raising support and funds for local charities that focus on women. Think you have what it takes to be a member of our 2019 Queen Bee Ambassador Program? Apply here today! Celebrating its fifth anniversary, the Queen Bee Half Marathon empowered by P&G and Kroger crowned a new champion Saturday, with Sarah Bishop,36, of Dayton, Ohio winning in a time of 1:19:22. Click here to view your official race photographs, as well as download your finisher certificates. Mark your calendars for our 2019 race. Registration is open now! October 11-12, 2019. Congratulations Queen Bees! Click here to view your results. A select group of runners and walkers has been buzzing through the finish line of the Queen Bee Half Marathon since the beginning. We call this royal group our “Queen’s Court,” as they’ve keep their consecutive Half Marathon streak going since 2013! Thanks and congratulations to our 2018 Queen Bee Half Marathon Queen’s Court! Bee-lieve it, girlfriend. 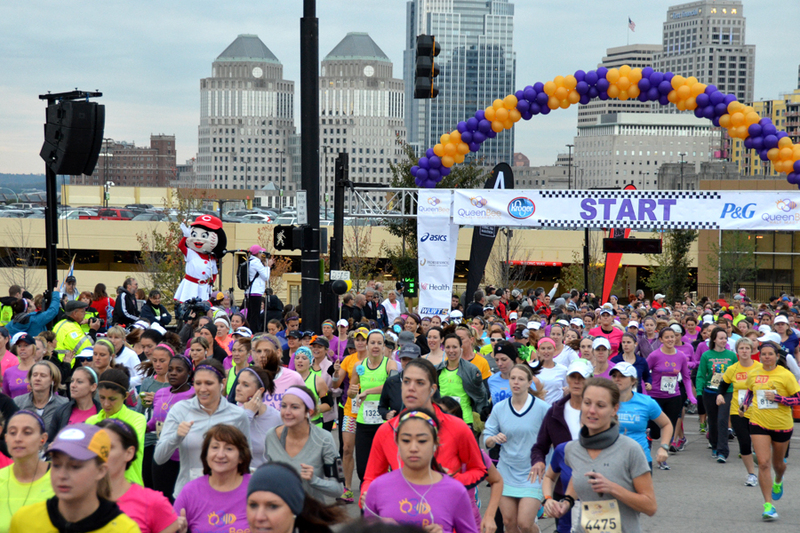 There’s a women’s half marathon in Cincinnati. The Queen Bee Half Marathon is on a mission: to promote the fun of fitness while raising support and funds for local charities that focus on women. Race weekend will include plenty of pampering, swag, and fun—the perfect ingredients for a great girls’ weekend. The course goes through some of Cincinnati’s historic and scenic neighborhoods and along the way you’ll be entertained by dozens of bands and DJs and refreshment zones that will ‘bee’ unique to the event. When you cross the finish line you’ll enjoy special swag, chocolates, massages, the one of a kind Queen Bee medal and an incredible after party! Not quite feeling up to the whole 13.1 miles? No problem. Buzz through Saturday’s 4-mile event through Downtown Cincinnati instead. You’ll be done in time to meet your half marathoners at the finish. Want to bee part of the Queen Bee Half Marathon?